If you frequently find yourself listening to music on the go, you’ve no doubt been disappointed to find how much ambient noise leaks through, whether it’s bus noise getting in the way of your Bach, a train announcer interrupting your trance sesh, or plane engines roaring over Placebo (or your carefully curated list of Disney classics, we’re not here to judge). If so, a pair of good noise cancelling headphones can make a huge difference, and we’ve rounded up the most highly-rated from across the shops to help you decide. A few things to know going in: first, there are two types of noise cancelling, active and passive. Realistically, any pair of on-ear or over-ear headphones can offer you a bit of passive noise reduction thanks to the materials of the cushions – that is, the bits that go on your ears – however there are some passive noise cancelling headphones specially engineered to block more sound than the average pair using sound-absorbing materials, just like the foam you see on recording studio walls. You can expect these to knock noise down by around 20 decibels, which may be ample for eliminating ambient noise when working from home, but not, for example, for blocking out the sound of a jet engine. Active noise-cancelling headphones step up to the plate here with an added level of effectiveness. They use the same preventative materials as passive ‘phones, but go a step further, erasing lower-frequency sounds by creating their own mimicking waves and flipping them 180 degrees to cancel out the intruders. Clever, eh? Oddly for a tech product, it doesn’t necessarily do to focus on the numbers when you’re shopping for headphones: decibels, hertz and noise-cancelling percentages can be misleading, and don’t really mean anything to the less initiated. Instead, we’ve collated the experiences of users who’ve enjoyed our top noise-cancelling headphones to give you a real-world example of how they’ll work for you. Are they comfortable? Are they worth the money? Do they work? Keep reading below to find out. It’s generally accepted that Bose QuietComfort are the best noise-cancelling headphones in the world, and the rave reviews they’ve earned over the years really give us no reason to argue. The experts say their active noise-cancelling is best in class and their sound beautifully balanced, users have commented on how comfortable they are on-ear even after hours of wear, and overall, if you’re happy to spend the money on these ‘phones, it seems you’re assured of a quality set. The one thing that sets these apart from the original 35s is not a necessity as such, but a nice little addition: Google Assistant functionality, which allows you to check phone notifications without digging around for your device or even having to say ‘OK Google’ out loud. Neat! These headphones have a distinct high-end look thanks to their unusual navy and gold colourway, and textured real-leather cushions and headband, a refreshing change from the usual faux leather fare which can look a little shiny and cheap on close inspection. To be fair, they’d want to look good for the rather high price, but the winner of What Hi-Fi? Best Wireless Headphones in their price range aren’t to be written off as a fashion item. The adaptive noise cancelling blocks ambient noise without muddying the sounds you want to listen to, and offers three different profiles to choose between. Some reviewers remarked that they were a little heavy but didn’t hold this against them, holding it up as a mark of the quality construction that can frustratingly be lacking in expensive headphones. While perhaps not the first brand name that comes to mind, Sennheiser are a well-trusted name in headphones that repeatedly delivers on its promise of quality. These noise-cancelling over-ear headphones are no different. Their all-encompassing design surrounds the ear for excellent passive noise cancelling, but reviewers found they were lightweight and comfortable despite their quite considerable size, and didn’t once pinch after hours of wear. Speaking of hours of wear, clock that battery life, a very impressive 30 hours, which elevates these already highly-rated headphones to new practical heights. These headphones might not have one of the bigger brand names attached to them, but don’t let that put you off. 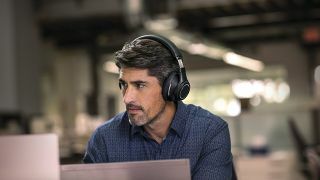 These are tops for tech thanks to their clever capabilities, which could come in very handy for the frequent listener, including anyone who uses headphones at the office. Take, for example, the automatic play/pause function that activates when you put on or take off the headphones; or DeepSleep mode, which puts them into a battery-saving hibernation mode when away from a twinned device. Reviewers were sold on the quality of the ANC both with music and without, and loved the ability to charge while using. All-round a really smart buy, and for a pretty smart price too. With up to 30 hours of battery life, the ability to switch between active and passive noise cancelling, and an unrivalled fold-flat design, these are our best noise-cancelling headphones for travelling. What AKG describe as “best in class noise cancelling technology” holds up under reviewers’ scrutiny, with users who’d tested them out on planes, trains and Tubes (no word on automobiles) saying they were phenomenal for sound quality and comfort. Perhaps most enticingly, you can continue to use them in passive mode even once that long-lasting battery has gone flat, making them the ideal choice for taking on the very longest journeys. Beats headphones have long been the go-to for style-conscious music lovers, and these wireless cans are easily the best-looking noise-cancelling headphones on our list. But that doesn’t mean Beats have resorted to, as they’re so often accused of, emphasising form over function. The noise-cancelling may not lead the pack, but it’s really not bad either, and when taken as a package along with the solid build quality, longevity of the battery (better than Bose), and what our friends at TechRadar called "just about perfect" wireless performance with Apple or Android tech, it looks to be a well-rounded – if pricey – buy. All on-ear headphones can start to look pretty much of a muchness after a while, but not so with these fashion-forward Philips headphones, whose high-end design sets them apart from the competition. While reviewers generally agreed that there is better noise-cancelling out there, the consensus is that these offer unbeatable value with really high-end sound quality for the price, and long-wear comfort to rival some much more expensive pairs. Add to that the slim, rounded band and mesh-detail cans, and you have a good-looking and high-performing package for not too much dosh. Well worth considering if you don’t frequently need high levels of noise cancelling. Over-ear noise-cancelling headphones give you two lines of defence against ambient racket, and this Sony model is a prime example of how well that can work when it comes to making and taking voice calls. Reviewers said this was the best noise cancelling they’d come across for the price, and cited a meeting of great sound and build quality as their reason for rating this set so highly, but their ability to handle voice calls is what grabs our attention. You can turn down your music to take an incoming call without turning your headphones off completely, simply by placing your hand over the housing, and when the call is over, return to your music without missing any important audio cues like announcements. These Bose in-ear headphones allow you to set the level of noise cancellation to adapt to your surroundings, a very clever solution if you sometimes want to be totally immersed, and other times enjoy some music or an audiobook while still keeping an ear out for your Tube stop. If you feel uncomfortable or overburdened with heavier on-ear headphones, these noise-cancelling earbuds could be a good alternative, although the plastic collar that sits at the back of your neck and keeps them in place might not be for everyone. It does, however, mean that they can stay wireless, connecting simply to smart devices using Bluetooth or NFC. Reviewers have cautioned that ambient noise can be funnelled down to the receiver during voice calls, so if you frequently need to be heard on the line, consider something like the Sony MDR instead. In the market for some workout-friendly headphones? Take a look at our list of the best fitness headphones and earbuds to make that HIIT go by in a flash.